Bloggers should be wary of low productivity due to wilfing and wasting time. It is important not to waste time and be disciplined to ensure higher output. 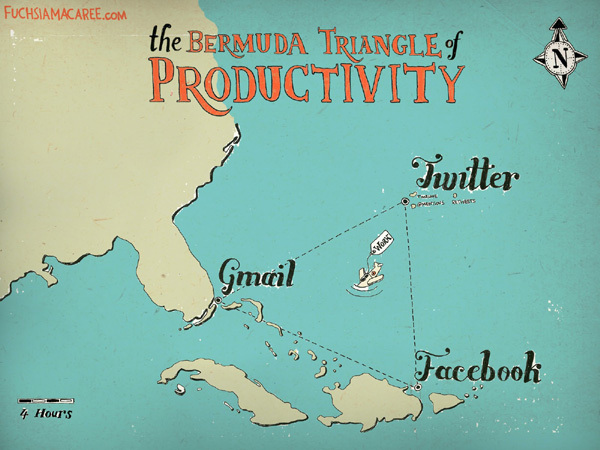 Don’t get trapped in Bermuda Triangle of low productivity created by Gmail, Facebook and Twitter! A lot of people waste a LOT of time on Internet. I know tens (if not hundreds) of folks who work (?) on an internet connected computer for more than 12 hours every day. And of course, yours truly is one of them! But, in general, productivity of most of the internet connected people is proportionately far lesser than the time they invest. Professional bloggers are also victim of what is called WILFing. Instead of focusing on making an income online, they waste too much of their time due to wilfing. What? you don’t know what is wilfing? No wonder you never thought if you were leaking time from the cauldron of life! Wilfing points to a phenomenon (and big issue) of people getting lost in the ocean of internet. They forget their original objective and get strayed. You can see websites like pirates who hijack your boat and take it away (even farther away) from your journey path. And what do these pirates steal? They steal your time! Significant amount of precious time lapses before one realizes that she was there on Internet to actually do something —to achieve a clearly defined goal. Web browsing isn’t called “surfing” for no reason! Waves of jumping from one website to another take you away from your desired destination. You find yourself stuck in the web of links. Worse is that you feel happy about it and don’t realize the danger. Sometime ago Fuchsia Macaree produced an interesting illustration that depicted a “Bermuda Triangle” created together by Gmail, Facebook and Twitter. Plane of your productivity sinks in this vile triangle if it gets trapped. Don’t get trapped in the Bermuda Triangle of Productivity. For bloggers, it is very important to keep their eyes fixed on their daily goals. Yes, research is an important part of niche blogging —and research requires every blogger to visit various websites —read hundred of articles —but while doing research, a blogger must not lose sight of what was the intended output of research. You should set aside a definite amount of time for research. For example, you may decide that for so-and-so topic you will dedicated only 40 minutes of your time in research. Once these 40 minutes are over, you’ll begin to formulate your own views with the help of material found in research. And then start writing your article. If you’re prone to the wilfing syndrome, you should set an alarm in your your mobile phone, computer (or an old fashioned time-piece from grandma era). Set alarm to ring after, let’s say 40 minutes. That ring will not only wake you from your drift on the waves of internet but also will keep you on tighter schedule. When the alarm sets off, just stop your research (or wilfing for that matter) and begin to organize your thoughts around the topic in focus. I have said it time and again, professional blogging is a serious business. You must not think that it is an easy, arm-chair stuff that will make you loads of run-of-the-mill money. You must treat professional blogging as a full-time job and have to discipline yourself to maximize productivity. So, tell me, have you been a victim of wilfing or Bermuda Triangle of Productivity? Share with us how you tackle this problem. I was searching for money making article and I ended up reading your 20 ways to make money online article. I started a blog a month ago. Revenue wise my expectation from my blog is very less. I am clearly focused on building it for few months and only later will focus on money. I have written few articles as of now. I am finding it difficult what niche to focus and blog on. Also there are some questions about design and theme for which I don’t have any answers. one thing I wanted to ask, do you provide some paid service for upcoming bloggers and also can you give some feedback on my blog. I do provide paid consultancy services to bloggers but only to the select clients. The blog should have reached a basic traffic level before I consider it for consultation. first of all thank you! I have been reading different article on your blog including this one. so I got an ideas cause I actually don’t like how people lose a lot of time on Facebook …. so Mr you have been talking about professional blogger, and I got one serious question. I am not a programmer like you are and I need to own my blog so to get off that triangle and do something productive. is it possible to this for someone like me who doesn’t know any thing about programming? if so how? actually I studied physics and I think I can use my knowledge to help others. Hi Daniel, thanks for your comment. Yes, you can also have a blog. Nowadays it is very easy to setup a blog and just begin writing! There are various blogging platforms (like Blogspot and WordPress) that instantly give you a blog of your own and that too for free! It’s great that you have started to think about sharing your physics knowledge with others. Go ahead! Thanks a lot! Go on!